Tokio Marine Life Insurance Malaysia Bhd was formerly known as TM Asia Life Malaysia Bhd, an established life insurance company that provided Malaysians with trusted services for more than 65 years. Tokio Marine Life’s presence in Malaysia is the result of the strategic alliance between Tokio Marine & Nichido Fire Insurance Co., Ltd. and Asia General Holdings (Asia Life’s parent company) on 9 March 2007. Founded in August 1879, Tokio Marine & Nichido Fire Insurance Co., Ltd. is one of the oldest and largest non-life insurance company in Japan. As the flagship company of Tokio Marine Holdings, Inc. (formerly known as Millea Holdings, Inc. until 1 July 2008), Tokio Marine & Nichido Fire Insurance Co., Ltd. has its headquarters in Tokyo and a worldwide network throughout 37 countries in 456 cities. 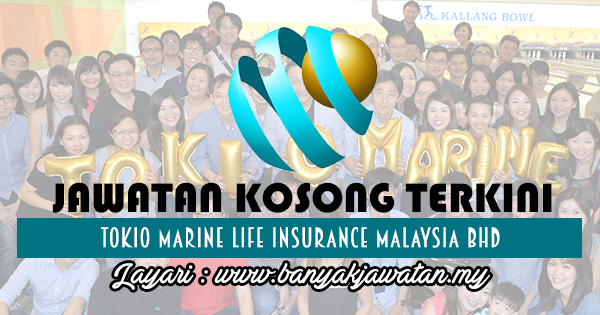 0 Response to "Jawatan Kosong di Tokio Marine Life Insurance Malaysia Bhd - 7 January 2018"